Adventure.Travel finds the best adventure companies and stories for you to constantly remain equipped and inspired to travel the world. We are the voice of travel businesses committed to long-term, sustainable growth of adventure travel around the globe. These businesses are members of the Adventure Travel Trade Association and are committed to values that drive a necessary movement to change travel so that it benefits the businesses, the people and the environment of the places we travel. 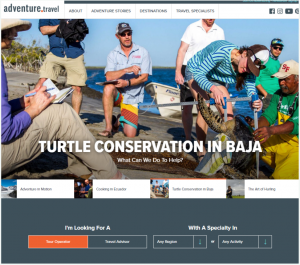 Adventure Stories is Adventure.Travel’s original online content initiative. We publish fresh, timely, and positive stories that promote sustainable tourism and adventure travel to our readers. Evocative of journeys, trails, and visionary in purpose, this column features original, first-person narratives based on exceptional travel experiences that reinforce a sense of purpose and doing good. We particularly like content themes in the following categories: nature, culture, adventure, conscious travel, sustainable travel, community focused tourism, wildlife conservation, etc. This column showcases timely photo and video content. We accept pitches regarding interesting photo essays, regional photo highlights, Instagram of the Month features, viral video features, etc. the topic. Tell us if you can provide your own original images. Pay is based on the story vertical you pitch, as well as length and image supplements. You must be a media member of the ATTA to publish stories on Adventure.Travel – if you are not a member and would like to be, we can negotiate when we discuss payment. If commissioned, you must be available for rounds of feedback and editing. Once commissioned, ATTA is happy to send a Journalist Alert to the ATTA Membership on your behalf, if you need additional interviews, research, and insight from tour operators, destinations, gear providers and other industry professionals around the world.